Storms are on the rise according to statistics from NOAA and the Weather Channel. Guardian provides a full line of Storm Shutters and ships National and International. Find your shutter installation area and share the facts with your customers…”Storms are on the Rise”. Updated 10/18/2012 check back we will be updating this file. Tornadoes have much higher wind speeds then Hurricanes, but at a much smaller scale and can occur at any time of the year. Tornado season typically begins in March, peaks in May and trails off in June and July. Based on the Fujita Scale, F0 to F5, only 1% of all Tornadoes are higher than F4 or 165 mph. The table below is based on frequency and damage cost. Protecting home and business window and door openings from tornado debris can minimize damage. Texas averages 125 tornadoes each year. Oklahoma averages 57 tornadoes each year. Over a 140 tornadoes in Oklahoma City alone. Kansas averages 55 tornadoes each year. Florida averages 55 tornadoes each year. Focused in Tampa Florida and Clearwater between 2 and 7 each year. According to NOAA the numbers are different, but regardless Tornado damage can be minimized with Window and Door Storm Protection. Wikipedia is another great resource for Tornado Storm Damage Statistics. 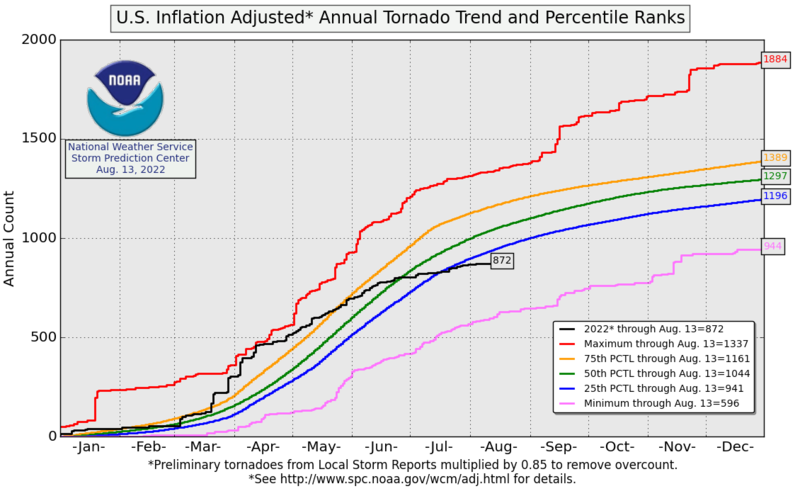 Tornadoes are on the increase, click the NOAA Tornado Chart below. Read this FEMA Hurricane survival story. As a shutter installer you need to know all the facts for the customers you serve. Plywood window coverings are not easily installed, especially by the elderly, will take an average of 1 to 3 hours per opening to install and lumber yards could run out of stock before the hurricane. This is why Guardian Storm Security offers many different Hurricane Shutter brands. Hurricane Shutters vary not only in Rolling Shutters and Accordion Shutters, but also in Type, Price, Quality, and Design Guardian can manufacture what best fits you and your customers. How often can you expect a Hurricane or Tropical Storm? Check outHurricane City.com, this table is 157 years of data. This table includes cities within 60 to 70 miles of a storm and subject to damages. Read more about Storm and Hurricane Shutter Discounts to inform your customers. This is a good article on what Florida residents can expect with the new Citizens Insurances Inspections. CITIZENS PROPERTY INSURANCE CORPORATION. FLORIDA BUILDING CODE SHUTTER WALL & ROOFING MITIGATION VERIFICATION.